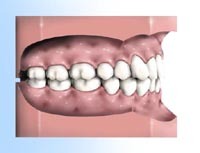 - Place the brush at a 45-degree angle against the gums. - Gently move the brush back and forth in short (half-a-tooth-wide strokes). - Brush the inner, then outer, and finally the chewing surfaces of the teeth. - Use the “toe” of the brush to reach the inner front tooth surfaces. - Brush your tongue to help freshen your breath. Tips on toothbrush selection: Any toothbrush or oral hygiene device should be ADA accepted. Look for the sign of acceptance on all products. Be sure to brush thoroughly with ADA accepted and approved fluoride toothpaste at least twice a day, more often if your dentist recommends it. If you notice any repeated discomfort after brushing, consult your dentist. Your dentist or hygienist can recommend a good ADA accepted toothbrush or oral hygiene device. For general use, select a brush with soft end-rounded or polished bristles. The size and shape of your toothbrush should allow you to reach every tooth. Children need to use smaller brushes than adults do. Worn-out toothbrushes cannot properly clean your teeth and may injure your gums. It is important to replace your toothbrush every three or four months or sooner, if the bristles become worn. - Break off about 18 inches of ADA accepted floss and wind most of it around one of your middle fingers. - Wind the remaining between thumbs and forefingers, with about an inch of floss between them, leaving no slack. Use a gentle “sawing motion” to guide the flow between your teeth. Do not jerk or snap the floss into the gums. - When the floss reaches the gum line, curve it into a C-shape against one tooth. Gently slide it into the space between the gum and tooth until you reel resistance. - Hold the floss against the tooth. Gently scrape the side of the tooth, moving the floss away from the gum. - Don’t forget the backside of your last tooth. When flossing, establish a regular pattern. Do the top half on one side, then the other. Move to the bottom half on one side, then the other. This way you’re less likely to miss any teeth. You may experience sore or bleeding gums for the first five or six days that you floss. This should stop once the plaque is broken up and the bacteria removed. If bleeding does not stop, call your dentist. Improper flossing may be harming your gums. Good oral hygiene requires the use of appropriate dental care products. Ask your dentist or hygienist for opinions and recommendations. Always look for products with the ADA Seal of Acceptance. Before the seal is awarded, a product must undergo strict testing for safety and effectiveness. Claims made on the labels of products bearing the ADA Seal must be accurate in what they say and what they imply. When choosing a toothpaste or gel, look for a product containing fluoride. Fluoride helps reduce tooth decay in adults and children. If you have sensitive teeth, your dentist may recommend a special toothpaste. Electric toothbrushes can be as effective as manual brushes. Persons with physical handicaps may find an electric toothbrush easier to use. Children may be more inclined to brush regularly because of the novelty of using an electric toothbrush. Oral irrigating devices use a stream of water to remove food particles from around the teeth. These devices can be helpful for persons wearing orthodontic bands or fixed partial dentures. Oral irrigators are meant to enhance, not replace, regular brushing and flossing. A fluoride mouth rinse can help prevent tooth decay. Your dentist may recommend an antimicrobial mouth rinse to help control plaque and reduce gingivitis. Mouthwashes are primarily used to freshen breath. If you must constantly use breath freshener to hide unpleasant mouth odor, see your dentist. Bad breath can be a sign of poor health. Persons who have trouble handling floss may wish to try a commercial floss holder or an interdental cleaning aid. Interdental cleaning aids include picks, sticks, or interdental brushes used to remove plaque from between teeth. Your dentist can explain the proper use of these instruments.